HGH Therapy in Tijuana, Mexico. What’s keeping you from feeling strong healthy again? What is Hormone Replacement Therapy HRT in Tijuana, Mexico? 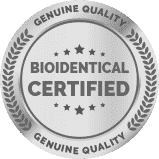 These are medically approved therapies designed to help adult men and women compensate for the low-level production of key hormones that the body needs for optimal performance and which the body stop producing at the same level as we get older. What is Hormone Replacement Therapy HRT?